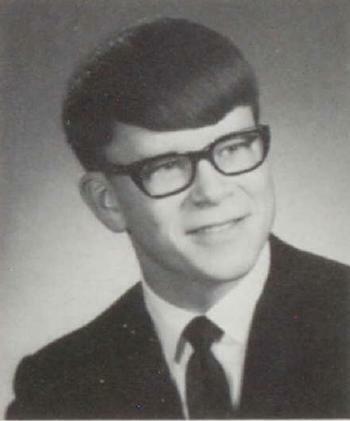 Gerald Robert Schuette was born on 12 February 1946 at Reedsburg, Sauk, Wisconsin. He was the son of William Friederick Arnold Schuette and Lyda Anna Maria Stolte. Gerald Robert Schuette died on 14 March 2012 at age 66 Gerald R. Schuette, age 66, of Loganville, died on Wednesday, March 14, 2012 in his home following a courageous battle with cancer. He was born on February 12, 1946 in Reedsburg, the son of William and Lyda (Stolte) Schuette. On August 5, 1967, he was married to the former Donna Walker. Jerry was a lifelong farmer in the Township of Westfield and also a lifelong member of St. Peter's Lutheran Church. Jerry was a servant of the land who enjoyed being in the out of doors, nature, hunting and spending time with his grandchildren. Survivors include his wife, Donna; his mother: Lyda Schuette, of Reedsburg; two daughters: Deborah (Curt) Justman, of Hartford and Dani (Matt) Scott, of Reedsburg; four grandchildren: Caleb, Casey, J.T. and Abbie; two brothers: William Schuette, of Reedsburg and Kenneth (Carla) Schuette, of Lake Zurich, IL; three sisters: Betty Kintz, and her special friend, George, of Lacey, WA; Nancy Schuette, of Madison and Patsy (Marty) McCluskey, of Hillpoint; his mother-in-law: Doris Walker, of Wisconsin Rapids; many nieces and nephews; other relatives and friends. He was preceded in death by his father; his brother: David Schuette and his father-in-law: Harold Walker. Funeral services will be conducted at 2:00 P.M. on Sunday, March 18, 2012 at St. Peter's Lutheran Church in Loganville with Pastor Christopher Miller officiating. Interment will be in St. Peter's Cemetery. The family will receive friends from 4:00 P.M. to 8:00 P.M. on Saturday at the Hoof Funeral Home in Reedsburg. In lieu of flowers, memorials to the UW Carbone Cancer Center would be appreciated. The Hoof Funeral Home is serving the family. 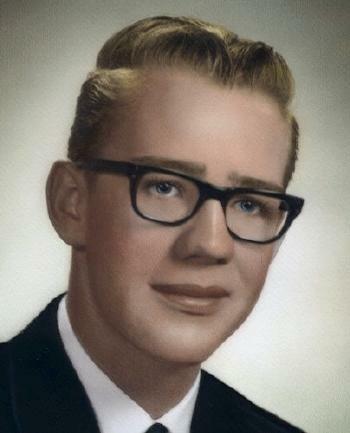 Gerald Robert Schuette graduated in 1964 at Webb High School, Reedsburg, Sauk, Wisconsin. David Roger Schuette was born on 18 July 1947 at Reedsburg, Sauk, Wisconsin. 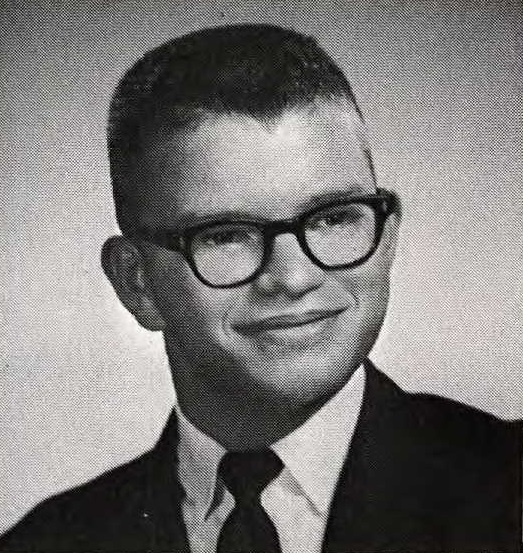 David Roger Schuette died on 26 June 1967 at Sauk, Wisconsin, at age 19. Married Name 11 February 1904 As of 11 February 1904,her married name was Schrank. Emma Hinrichs was born on 11 August 1885 at Reedsburg, Sauk, Wisconsin, also reported Aug 1884. Emma Hinrichs died on 28 December 1962 at Reedsburg, Sauk, Wisconsin, at age 77. Schrank family gathering - sisters and sisters-in-law including Louise (Schrank) Friede circa 1940s. 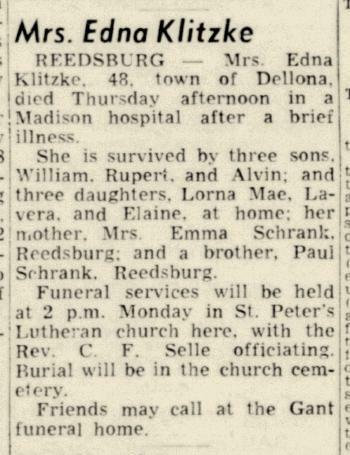 [S387] Family Search; Multiple Records, "Wisconsin, County Marriages, 1836-1911," database, FamilySearch (https://familysearch.org/ark:/61903/1:1:XRFL-TM5 : 3 June 2016), Matilda Koeppe in entry for Herman William Edward Schrank and Emma Dorothea Katharine Heinricks, 11 Feb 1904; citing , Sauk, Wisconsin, United States, Wisconsin Historical Society, Madison; FHL microfilm 1,275,562. [S214] Wisconsin Sauk Co Cemetery Records Vol 9, Pg. 148. [S245] U.S. Federal Census 1900 U.S. Federal Census, by Ancestry.com, ED143. Dwelling 198. [S244] U.S. Federal Census 1910 U.S. Federal Census, by Ancestry.com, ED125. Dwelling 208. [S243] U.S. Federal Census 1920 U.S. Federal Census, by Ancestry.com, Sheet 8B. Dwelling 120. ED 176. Stamp 206B line 87. [S250] U.S. Federal Census 1930 U.S. Federal Census, by Ancestry.com, ED56-31. Dwelling 85. [S373] U.S. Federal Census 1940 U.S. Federal Census, by Ancestry.com, Year: 1940; Census Place: Reedsburg, Sauk, Wisconsin; Roll: T627_4523; Page: 2A; Enumeration District: 56-33. Name Variation Edna Elsa Marie Schrank was also known as Edna Emma. Married Name 7 November 1923 As of 7 November 1923,her married name was Klitzke. Married Name 7 November 1923 As of 7 November 1923,her married name was Schrank-Klitzke. Edna Elsa Marie Schrank was born on 17 December 1904 at Reedsburg, Sauk, Wisconsin. She was the daughter of Herman Edward Schrank and Emma Hinrichs. 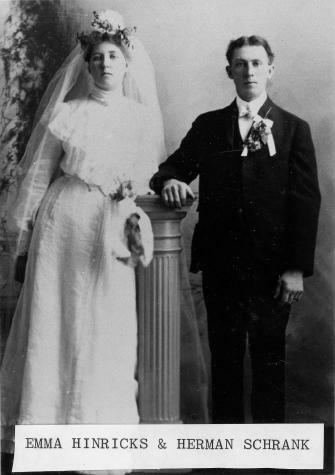 Edna Elsa Marie Schrank married William Fredrick Klitzke, son of William F. H. Klitzke and Emma B. Dwars, on 7 November 1923 at Reedsburg, Sauk, Wisconsin. 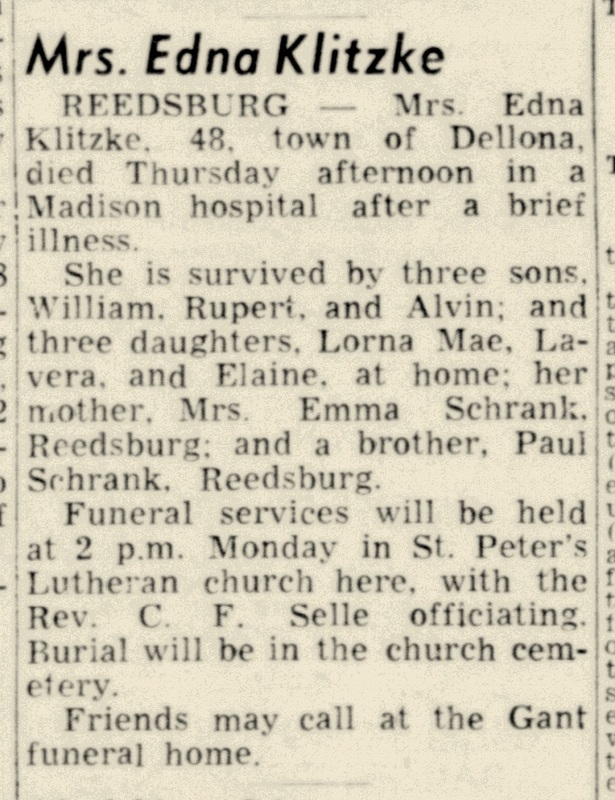 Edna Elsa Marie Schrank died on 2 July 1953 at age 48 Edna (Schrank) Klitzke obituary. 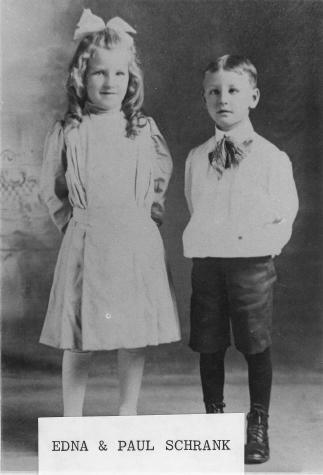 William farmed all his life, his wife, Edna, was a housewife.5 Portrait of siblings Edna and Paul Schrank circa 1915. [S214] Wisconsin Sauk Co Cemetery Records Vol 9, Pg 154. [S250] U.S. Federal Census 1930 U.S. Federal Census, by Ancestry.com, ED56-31. Dwelling 48. Name Variation Paul Ervin Schrank was also known as Paul Irvin. He was the son of Herman Edward Schrank and Emma Hinrichs. Paul Ervin Schrank married Alice Emilie Bertha Wagner at Reedsburg, Sauk, Wisconsin, on 28 October 1939. Paul Ervin Schrank died on 16 January 1977 at Reedsburg, Sauk, Wisconsin, at age 70 Paul Ervin Schrank obituary. 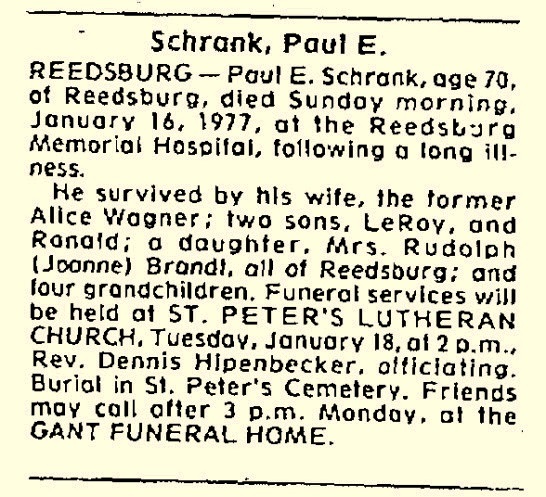 According to The Schrank Family Heritage: Paul was a Farmer near Reedsburg all his life. His wife, Alice, worked at Sportswear as a seamstress for 30 years. Paul Ervin Schrank obtained US Social Security Card at Wisconsin; last residence Reedsburg, Sauk, Wisconsin. Portrait of siblings Edna and Paul Schrank circa 1915. 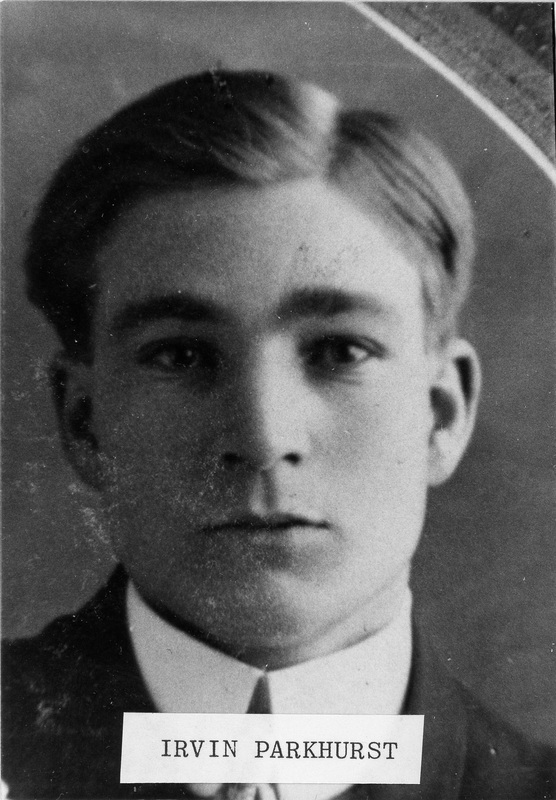 [S6] Wisconsin, Wisconsin Vital Record to 1907, Paul I Schrank born 26 Feb 1906 Sauk County Reel 266 Record 1497. Name Variation William Fredrick Klitzke was also known as William Friedrick. Name Variation William Fredrick Klitzke was also known as Willie. 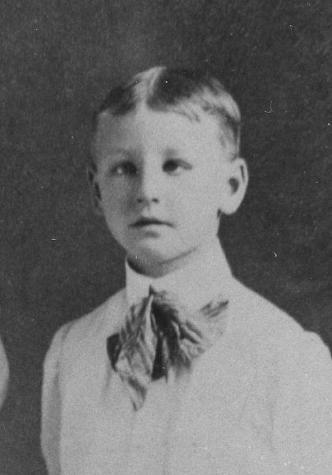 William Fredrick Klitzke was born at Wisconsin on 21 August 1897. He was the son of William F. H. Klitzke and Emma B. Dwars. 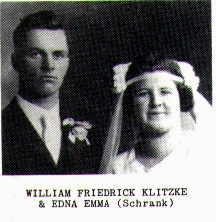 William Fredrick Klitzke married Edna Elsa Marie Schrank, daughter of Herman Edward Schrank and Emma Hinrichs, on 7 November 1923 at Reedsburg, Sauk, Wisconsin. 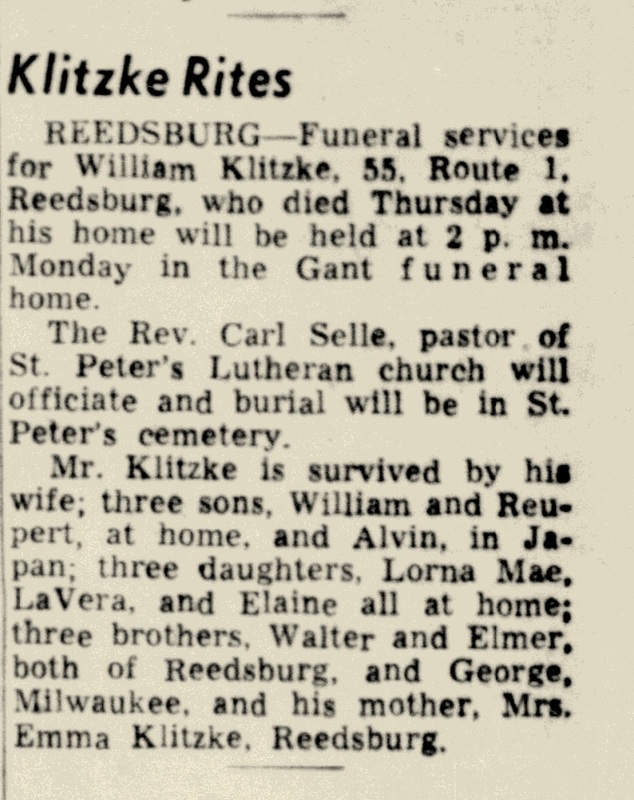 William Fredrick Klitzke died on 14 May 1953 at age 55 William Klitzke obituary. On 25 August 1918 at World War I Draft Registration, Sauk, Wisconsin. In March 1926 at at the Henry Schrank home, Sauk, Wisconsin, Schrank family reunion; guest of honor William Schrank Sr.
[S245] U.S. Federal Census 1900 U.S. Federal Census, by Ancestry.com, ED143. Dwelling 129. [S244] U.S. Federal Census 1910 U.S. Federal Census, by Ancestry.com, ED125. Dwelling 201. [S243] U.S. Federal Census 1920 U.S. Federal Census, by Ancestry.com, Sheet 8B. Dwelling 124. ED 176. Stamp 206B. William Herman Klitzke was born on 28 March 1928 at Reedsburg, Sauk, Wisconsin. He was the son of William Fredrick Klitzke and Edna Elsa Marie Schrank. William Herman Klitzke died on 31 January 2017 at age 88 William H. Klitzke, age 88, of Reedsburg, died peacefully on Tuesday, January 31, 2017 in the Reedsburg Area Senior Life Center surrounded by his family. 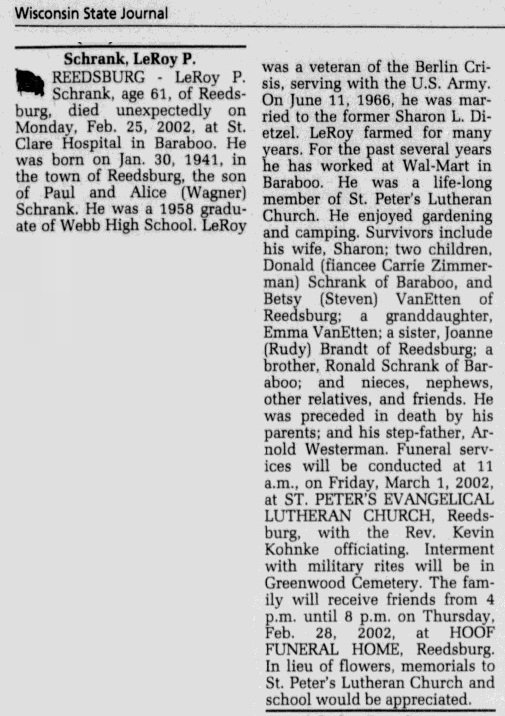 He was born on March 28, 1928 in Reedsburg, the son of William F. and Edna (Schrank) Klitzke. Willie was a veteran of the Korean Conflict serving with the U.S. Army. He was honored to have been awarded with the Purple Heart and the Bronze Star. On June 11, 1955, he was married to the former Evaline I. Craker. Willie was a lifelong area farmer and also worked at Grede Foundry. He was accessor for the Town of Dellona for several years. Willie was a member of the Reedsburg VFW and a lifelong member of St. Peter's Ev. Lutheran Church where he served on the school board for many years. He was very proud to have been able to participate in the Badger Honor Flight with his son, Dan. Willie enjoyed throwing horseshoes, dancing and bowling. 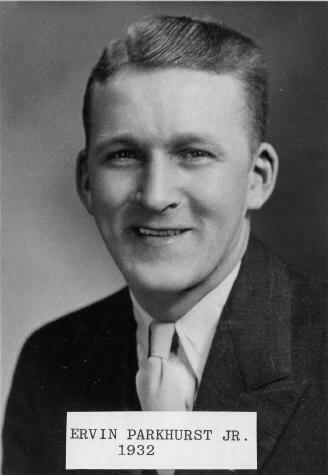 Survivors include his wife, Evaline; four children: Cindy (Vernon) Lippert, of Austin, MN; Marcia (Rodney) Sonnenberg, of Reedsburg; Dan (Sally) Klitzke, of Reedsburg and Julie (Rick) Miotke, of Reedsburg; ten grandchildren; one AFS granddaughter; 15 great grandchildren; two sisters: Lorna Slaney, of Reedsburg and LaVera (Marlan) Craker, of Reedsburg; one brother: Rupert (Delores) Klitzke, of Janesville; nieces and nephews; other relatives and friends. 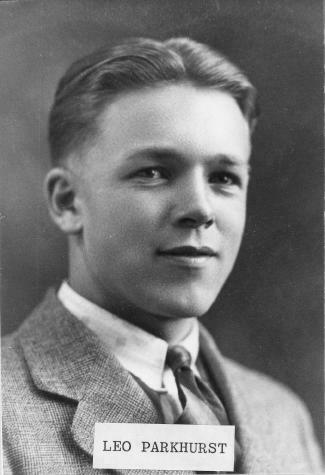 He was preceded in death by his parents; his son-in-law: Mike Ross; his sister: Elaine (Ray) Newbury; his brother: Alvin (Vicki) Klitzke and his brother-in-law: Maurice Slaney. Funeral services will be conducted at 11:00 A.M. on Saturday, February 4, 2017 at St. Peter's Ev. Lutheran Church in Reedsburg with Pastor Paul Crolius officiating. Interment will be in St. Peter's Cemetery with military rites provided by the Reedsburg Veterans Honor Guard. There will be a visitation from 4:00 P.M. to 8:00 P.M. on Friday at the Hoof Funeral Home in Reedsburg and after 10:00 A.M. on Saturday at the church. Memorials to St. Peter's Lutheran Church or the Reedsburg VFW would be appreciated. The Hoof Funeral Home is serving the family. He was buried after 31 January 2017 at Saint Peters Evangelical Lutheran Cemetery, Reedsburg, Sauk, Wisconsin. Alvin Paul Klitzke was born on 6 September 1929 at Reedsburg, Sauk, Wisconsin. Alvin Paul Klitzke died on 4 November 2009 at Sauk, Wisconsin, at age 80 Alvin, age 80, of Baraboo, passed away on Wednesday at the UW Hospital in Madison. 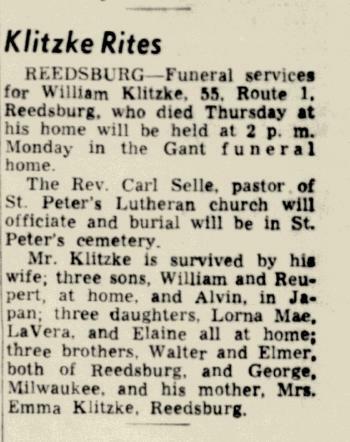 He was born the son of William & Edna (Schrank) Klitzke in Reedsburg. On Oct. 22, 1955, he was wed to Victorien "Vicky" Wilkinson. 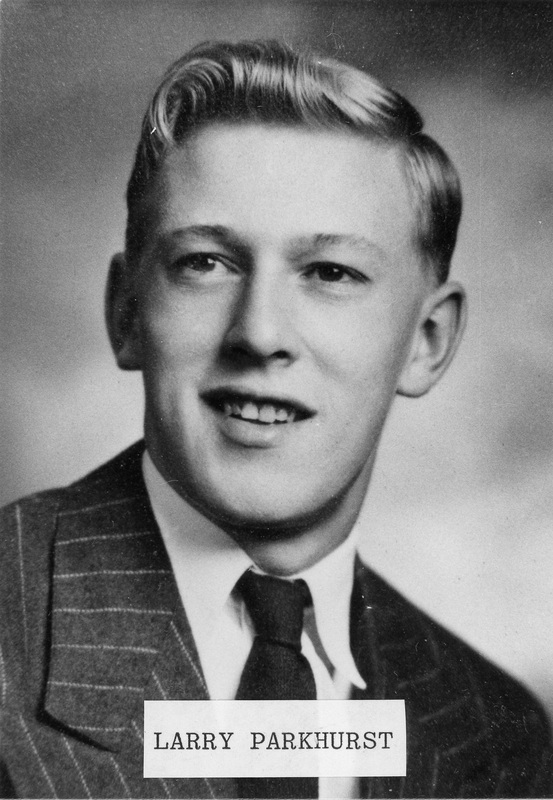 Alvin is survived by his wife, Vicky of 54 years; his daughter, Bonnie and Charles Eastman of Madison, WI; his son, Joey Klitzke of Baraboo, WI; and his son, Gregg and Terry (Birch) Klitzke of Baraboo, WI; five grandchildren, Amanda (William) Schmidt, Scott (Corrin) Maier, Casey Klitzke, Maverick Klitzke and Tristen Klitzke; and four great-grandchildren, Connor and Natalie Schmidt, and Owen and Addison Maier. He is also survived by his brother, William and Evaline Klitzke; his sister, Lorna and Maurice Slaney; his sister, La Vera and Marlan Craker all of Reedsburg, WI; his brother, Rupert and Delores Klitzke of Janesville, WI; and other relatives and many friends. Funeral services were held at St. Paul Lutheran Church in Baraboo with Pastors Deb and Steve Ohrtman officiating. Burial followed where military rites were provided by the Baraboo Veterans Honor Guard. There was an Elks Service held at the funeral home. The family wishes to thank the doctors, nurses and staff at UW Hospital Neurology ICU for their loving care. He was buried after 4 November 2009 at Walnut Hill Cemetery, Baraboo, Sauk, Wisconsin. Name Variation Alice Emilie Bertha Wagner was also known as Alice Emelia. Married Name 28 October 1939 As of 28 October 1939,her married name was Schrank. Married Name 22 September 1979 As of 22 September 1979,her married name was Westerman. Alice Emilie Bertha Wagner was born on 15 January 1917 at Reedsburg, Sauk, Wisconsin, also reported as 14 Jan 1917. She was the daughter of Henry Wagner and Amanda Luedtke. 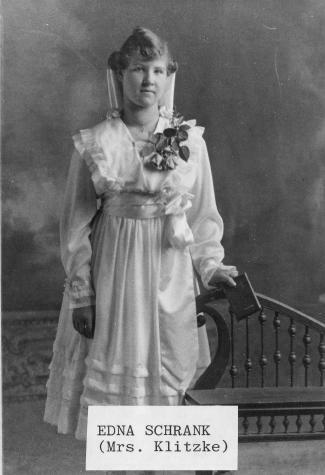 Alice Emilie Bertha Wagner was baptized on 25 February 1917 at St John Lutheran Church, Reedsburg, Sauk, Wisconsin. She married Arnold Westerman on 22 September 1979. Alice Emilie Bertha Wagner died on 16 June 1986 at Madison, Dane, Wisconsin, at age 69 Alice (Wagner) Schrank Westerman obituary. Alice Emilie Bertha Wagner obtained US Social Security Card at Wisconsin; last residence Reedsburg, Sauk, Wisconsin. [S250] U.S. Federal Census 1930 U.S. Federal Census, by Ancestry.com, Year: 1930; Census Place: Winfield, Sauk, Wisconsin; Roll 2609; Page: 5A; Enumeration District: 40; Image: 543.0. 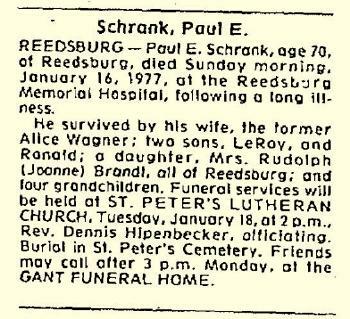 Leroy Paul Schrank was born on 30 January 1941 at Reedsburg, Sauk, Wisconsin. He was the son of Paul Ervin Schrank and Alice Emilie Bertha Wagner. Leroy Paul Schrank married Sharon L. Dietzel, daughter of Hugo Dietzel and Charlotte Elizabeth Kleeber, on 11 June 1966 at Reedsburg, Sauk, Wisconsin, Sharon Dietzel and LeRoy Schrank marriage announcement. 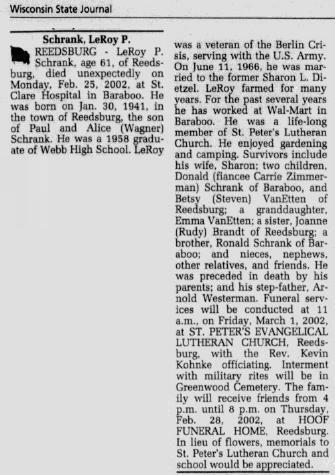 Leroy Paul Schrank died on 25 February 2002 at Baraboo, Sauk, Wisconsin, at age 61 LeRoy Paul Schrank obituary. Leroy Paul Schrank graduated in 1958 at Webb High School, Reedsburg, Sauk, Wisconsin. 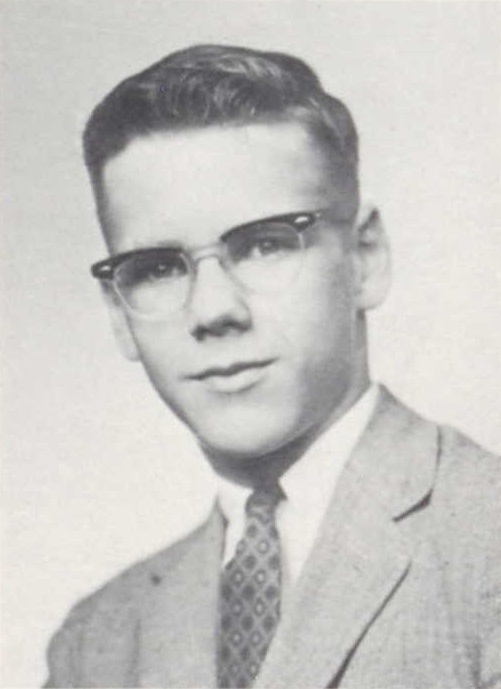 Ronald Henry Schrank was born on 8 October 1944 at Reedsburg, Sauk, Wisconsin. Ronald Henry Schrank died on 29 July 2007 at age 62. 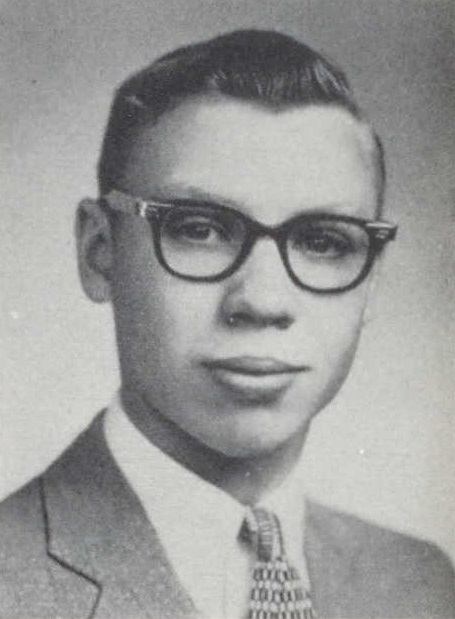 Ronald Henry Schrank graduated in 1962 at Webb High School, Reedsburg, Sauk, Wisconsin. Name Variation Irvin Alfanso Parkhurst was also known as E. A. Name Variation Irvin Alfanso Parkhurst was also known as Alfonzo. Name Variation Irvin Alfanso Parkhurst was also known as Ervin A.
Irvin Alfanso Parkhurst was born at Wisconsin on 25 April 1883. He was the son of John Parkhurst and Julia S. (?). Irvin Alfanso Parkhurst married Emma Amelia Schrank, daughter of William Charles Frederick Schrank and Matilda Augusta Koepp, on 5 November 1903 at Methodist; Methodist Church, Reedsburg, Wisconsin. Irvin Alfanso Parkhurst died on 31 August 1955 at Reedsburg, Sauk, Wisconsin, at age 72 Ervin Alfanso Parkhurst obituary. Circa 1905 family photo of Irvin and Emma (Schrank) Parkhurst and son Frederick. [S214] Wisconsin Sauk Co Cemetery Records Vol 9, Pg 127. [S245] U.S. Federal Census 1900 U.S. Federal Census, by Ancestry.com, ED142. Dwelling 182. [S244] U.S. Federal Census 1910 U.S. Federal Census, by Ancestry.com, ED124. Dwelling 204. [S243] U.S. Federal Census 1920 U.S. Federal Census, by Ancestry.com, ED 176. Pg 1B. Dwelling 20. [S250] U.S. Federal Census 1930 U.S. Federal Census, by Ancestry.com, ED56-30. Ward 2. Dwelling 443. [S373] U.S. Federal Census 1940 U.S. Federal Census, by Ancestry.com, Year: 1940; Census Place: Reedsburg, Sauk, Wisconsin; Roll: T627_4523; Page: 12A; Enumeration District: 56-32B. Frederick Ervin Parkhurst was born on 6 May 1904 at Reedsburg, Sauk, Wisconsin. He was the son of Irvin Alfanso Parkhurst and Emma Amelia Schrank. 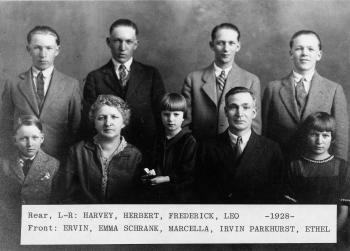 Frederick Ervin Parkhurst married Lillian Elvira Gustafson at Lutheran; Emmanuel Lutheran Church, Madison, Wisconsin, on 3 August 1929. Frederick Ervin Parkhurst died on 20 May 1977 at Indiana at age 73. He was buried after 20 May 1977 at Riverview Cemetery, South Bend, St. Joseph, Indiana. Fred worked as a baker, he was a salesman of Wearever Aluminum, and later he worked for Aukem products.Lillian worked as a clerk in the Wisconsin State License Bureau.4 Frederick Ervin Parkhurst obtained US Social Security Card at Wisconsin; last residence South Bend, St Joseph, Indiana. 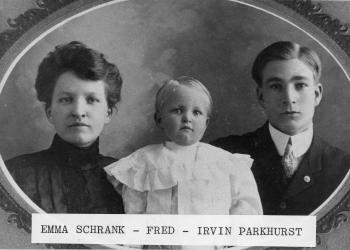 Circa 1905 family photo of Irvin and Emma (Schrank) Parkhurst and son Frederick. [S250] U.S. Federal Census 1930 U.S. Federal Census, by Ancestry.com, ED13-89. Dwelling 16-18. 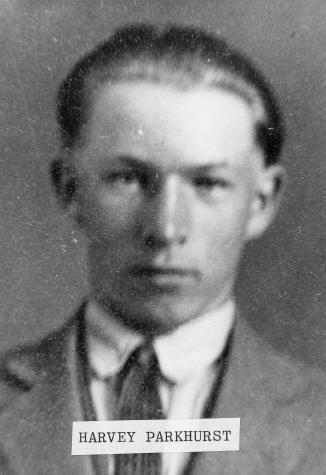 Herbert John Parkhurst was born on 22 July 1906 at Reedsburg, Sauk, Wisconsin. 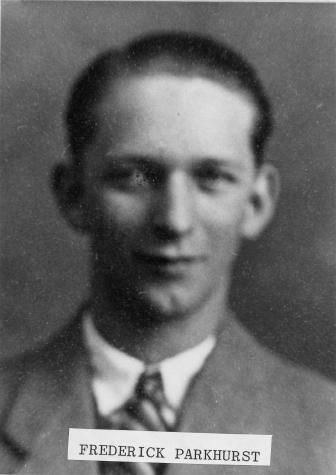 Herbert John Parkhurst married Anna C. Meurer at Madison, Wisconsin, on 5 September 1930. Herbert John Parkhurst died on 23 November 1971, at age 65. Herbert worked at Gisholt Machine, Fergins Bakery and for the University of Wisconsin.Ann babysat in her home in Madison for many years. 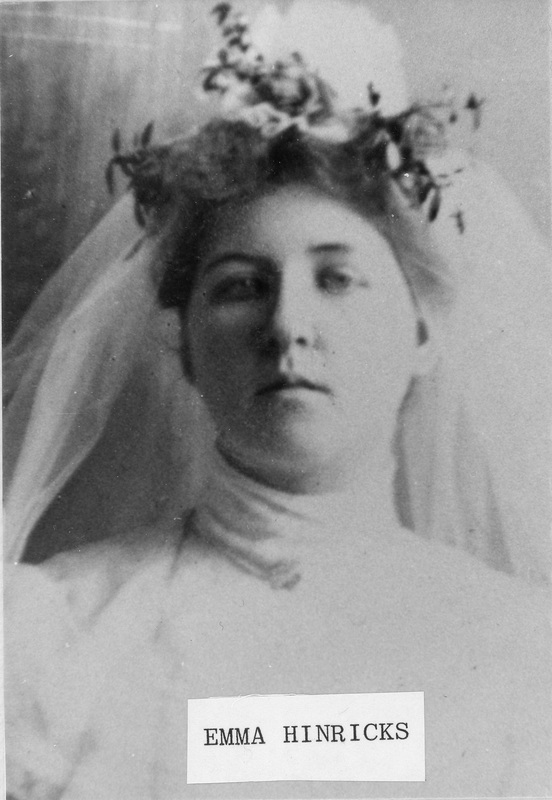 Before her marriage, she worked at the Burgess factory in Madison.3 Herbert John Parkhurst obtained US Social Security Card at Wisconsin; last residence Madison, Dane, Wisconsin. 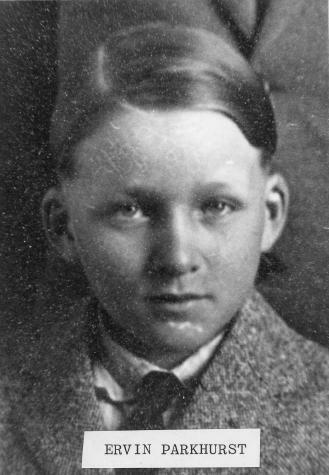 Harvey Durwood Parkhurst was born on 8 March 1908 at Reedsburg, Sauk, Wisconsin. 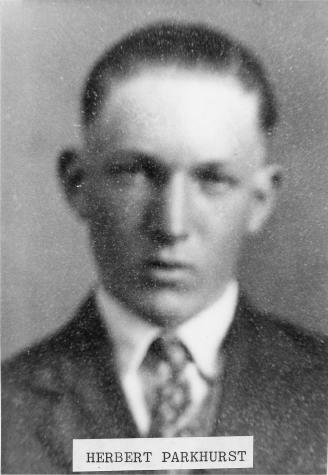 Harvey Durwood Parkhurst married Buelah Olive Laschinski at St. John's Lutheran Church, Reedsburg, Sauk, Wisconsin, on 9 October 1930. Harvey Durwood Parkhurst died on 18 January 1981, at age 72. Harvey worked at the Badger Ordinance Plant near Baraboo, Wisconsin, did weather stripping, was a local bartender, drove school bus, and worked on the pipeline in Alaska. He also operated teh old Cities Service Gas Station in Reedsburg.Buelah worked at the sewing factory and also in the deli at Ted & Fred's Supermarket, both in Reedsburg.Harvey and Buelah were active golfers and bowlers in the Reedsburg area.5 Harvey Durwood Parkhurst obtained US Social Security Card at Wisconsin; last residence Reedsburg, Sauk, Wisconsin. [S273] Wisconsin Sauk County, Wisconsin Cemetery Records, page 109. Leo Max Parkhurst was born on 19 July 1909 at Reedsburg, Sauk, Wisconsin. 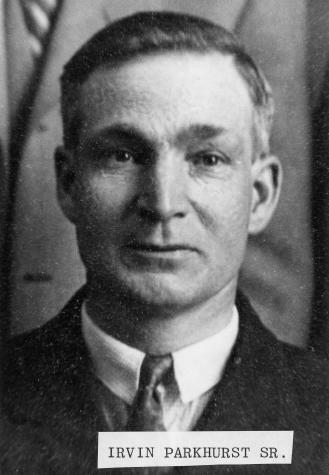 Leo Max Parkhurst married Elvira Dorothea Koenecke at Evangelical; Evangelical Church, Rockford, Illinois, on 17 October 1933. Leo Max Parkhurst died on 13 April 1982, at age 72. Leo Max Parkhurst obtained US Social Security Card at Wisconsin; last residence Reedsburg, Sauk, Wisconsin. Leo operated the old Cities Service Gas Station in Reedsburg in the early 1930's. He then worked for Dolly Madison Dairies for 8 years on a milk route. The following 30 years he worked as a Consignee for the Cities Service Gas Station in Reedsburg. Leo served several years on the Reedsburg Police and Fire Commission. He also had a dance band most of his life and played in the Sauk County Circus Band.5 He graduated in 1928 at Reedsburg High School, Reedsburg, Sauk, Wisconsin. Name Variation Ethel L. Parkhurst was also known as Ethel Etta. Ethel L. Parkhurst was born on 11 April 1912 at Reedsburg, Sauk, Wisconsin. She was the daughter of Irvin Alfanso Parkhurst and Emma Amelia Schrank. 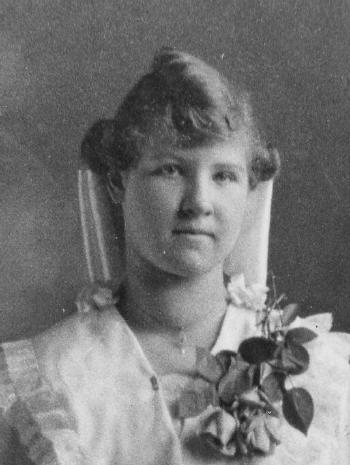 Ethel L. Parkhurst died on 5 April 1929, at age 16. 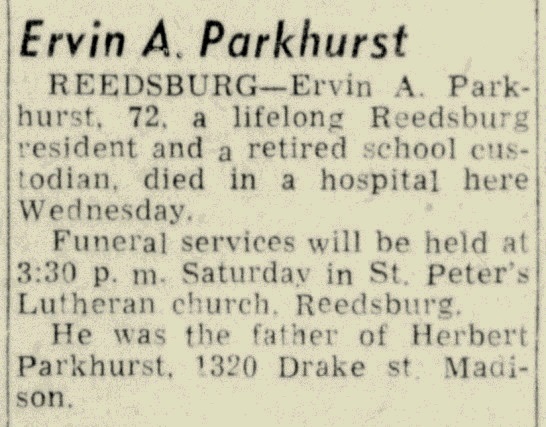 Ervin Robert Parkhurst was born on 20 December 1914 at Reedsburg, Sauk, Wisconsin. Ervin Robert Parkhurst married Kathleen Cora Ness on 14 February 1940 at Dubuque, Iowa. Ervin Robert Parkhurst died on 28 December 1986, at age 72. Ervin served in the US Navy, operated the Cities Service Station in Reedsburg, Wisconsin, and worked for the US Postal Service in San Antonio, Texas.He also owned and operated a grocery in LaValle, Wisconsin. 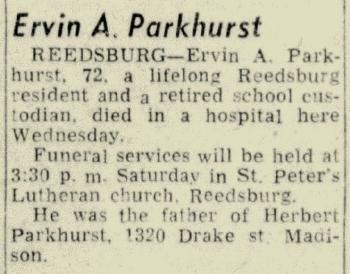 Ervin was a member of the LaValle American Legion.4 Ervin Robert Parkhurst obtained US Social Security Card at Wisconsin; last residence Reedsburg, Sauk, Wisconsin. He graduated in 1932 at Reedsburg High School, Reedsburg, Sauk, Wisconsin. Married Name 9 February 1945 As of 9 February 1945,her married name was Meurer. Marcella Loretta Parkhurst was born on 26 April 1919 at Reedsburg, Sauk, Wisconsin. Marcella Loretta Parkhurst married Jerome Frank Meurer, son of William Meurer and Agnes (? ), on 9 February 1945 at Central Lutheran Church, Tocoma, Washington, Lutheran. Marcella Loretta Parkhurst died on 22 September 2001 at age 82. 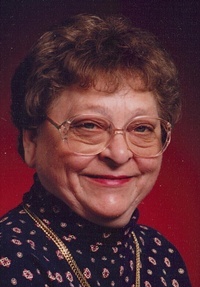 Marcella attended Sauk County Teacher's College, taught four years in Sauk County rural schools, and worked as as clerk in Schulz Brother's Variety Store in Reedsburg. She is now retired.Jerome was a truck driver for Robertson Trucking in Lodi, Wisconsin. He worked there for 16 years and retired in 1976 after a bad accident. He also worked for Korth Transfer for 27 years.Marcella and Jerome were married during WW II and moved to Lodi shortly thereafter. They lived in Lodi for 6 years. When her mother died, they moved in with her father in Reedsburg, Wisconsin.4 Marcella Loretta Parkhurst obtained US Social Security Card at Wisconsin; last residence Lodi, Columbia, Wisconsin. She graduated in 1937 at Reedsburg High School, Reedsburg, Sauk, Wisconsin. Lillian Elvira Gustafson was born at Illinois on 5 October 1908. She died on 1 March 1985, at age 76. Lillian Elvira Gustafson obtained US Social Security Card at Wisconsin; last residence Mishawaka, St Joseph, Indiana. 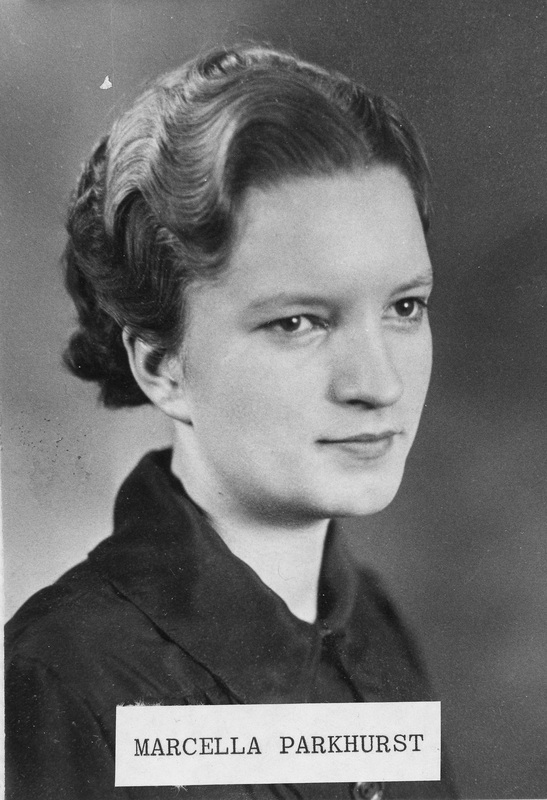 Anna C. Meurer was born on 19 February 1905. She was the daughter of William Meurer and Agnes (?). She died on 22 December 1991 at Madison, Dane, Wisconsin, at age 86. 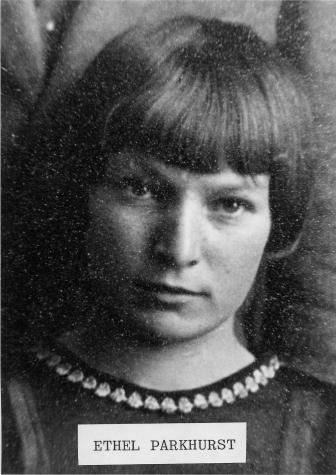 Name Variation Buelah Olive Laschinski was also known as Lachinski. Married Name 9 October 1930 As of 9 October 1930,her married name was Parkhurst. 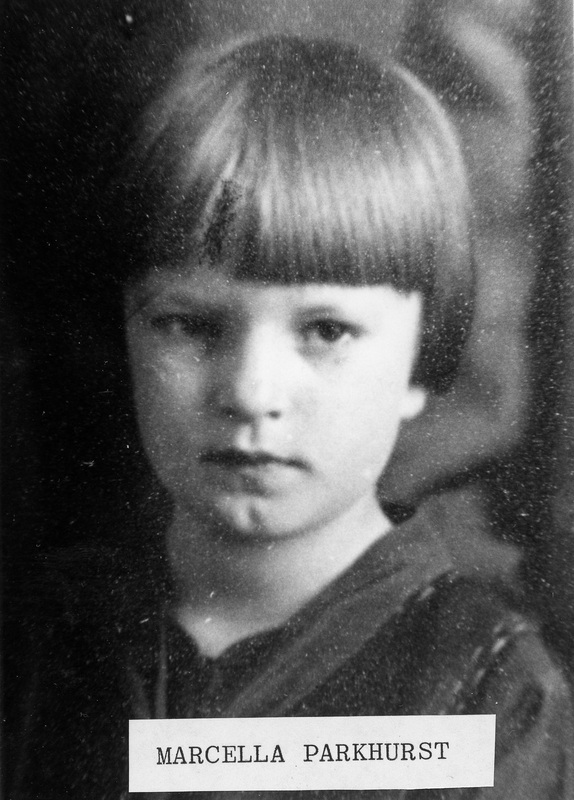 Buelah Olive Laschinski was born at Wisconsin on 17 March 1916. She was the daughter of Gustav C. Laschinski and Olive L. Holch. She died on 21 February 1985, at age 68. Buelah Olive Laschinski obtained US Social Security Card at Wisconsin; last residence Reedsburg, Sauk, Wisconsin. [S250] U.S. Federal Census 1930 U.S. Federal Census, by Ancestry.com, ED56-29. Dwelling 228. 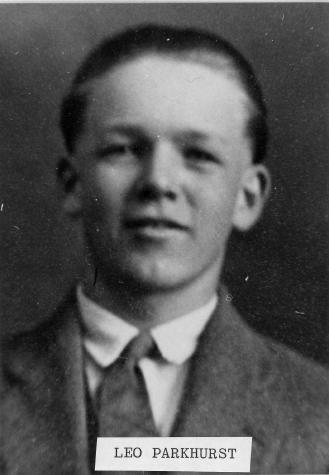 Name Variation Lawrence Harvey Parkhurst was also known as Larry. Lawrence Harvey Parkhurst was born at Mauston, Wisconsin, on 27 January 1931. He was the son of Harvey Durwood Parkhurst and Buelah Olive Laschinski. Lawrence Harvey Parkhurst married Marjorie Rose Faber, daughter of Gerald S. Faber and Bertilla Schmitz, on 1 September 1954. 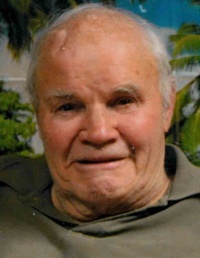 Lawrence Harvey Parkhurst died on 25 April 2008 at age 77. He was buried after 25 April 2008 at Calvary Cemetery, Reedsburg, Sauk, Wisconsin. Lawrence Harvey Parkhurst graduated in 1949 at Reedsburg High School, Reedsburg, Sauk, Wisconsin. Kenneth Eugene Parkhurst was born on 14 November 1935 at Reedsburg, Sauk, Wisconsin. Kenneth Eugene Parkhurst died on 26 September 1985 at age 49. He was buried after 26 September 1985 at Green Wood Cemetery, Reedsburg, Sauk, Wisconsin. 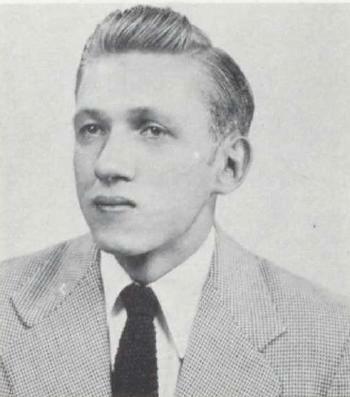 Kenneth Eugene Parkhurst graduated in 1954 at Reedsburg High School, Reedsburg, Sauk, Wisconsin. Name Variation Elvira Dorothea Koenecke was also known as Alvira. 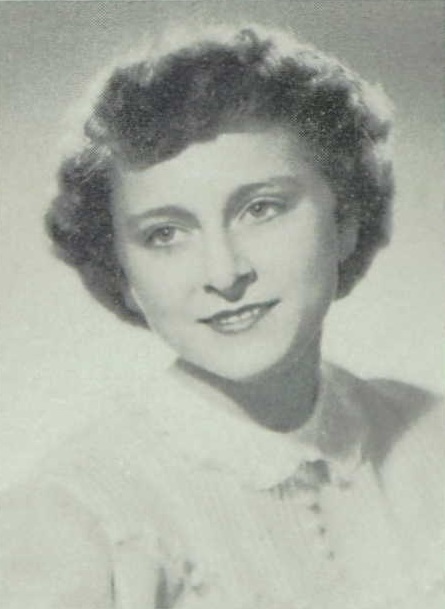 Elvira Dorothea Koenecke was born on 13 August 1911. She was the daughter of Walter W. Koenecke and Irene M. Wolter. She died on 24 July 1993 at age 81. Elvira Dorothea Koenecke obtained US Social Security Card at Wisconsin; last residence Reedsburg, Sauk, Wisconsin. Married Name 28 May 1955 As of 28 May 1955,her married name was Steinhorst. 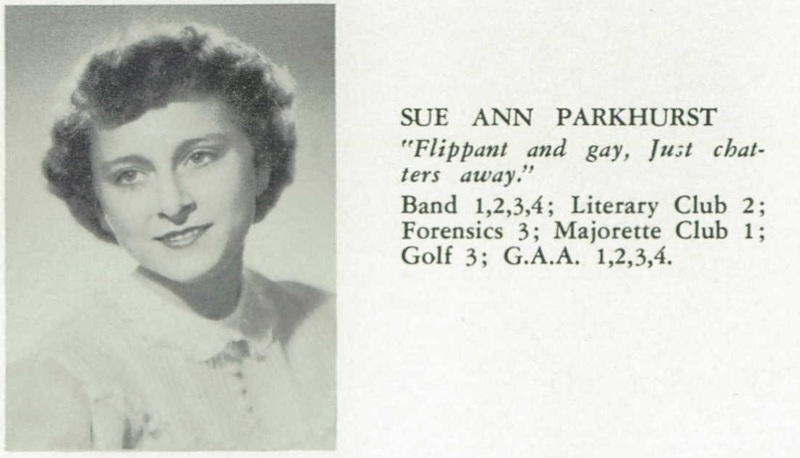 Sue Ann Parkhurst was born on 26 November 1934 at Reedsburg, Sauk, Wisconsin. She was the daughter of Leo Max Parkhurst and Elvira Dorothea Koenecke. Sue Ann Parkhurst died on 26 January 2013 at age 78 Sue A. Steinhorst, age 78, of Reedsburg, died unexpectedly on Saturday, January 26, 2013 at Maplewood of Sauk Prairie. 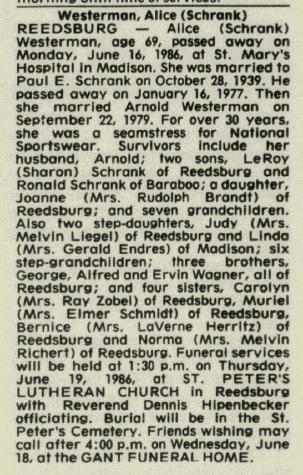 She was born on November 26, 1934 in Reedsburg, the daughter of Leo and Elvira (Koenecke) Parkhurst. On May 28, 1955, she was married to Roger "Jake" Steinhorst. Sue was a very devoted and loving wife, mother and grandmother. She enjoyed fishing and playing solitaire on the computer. 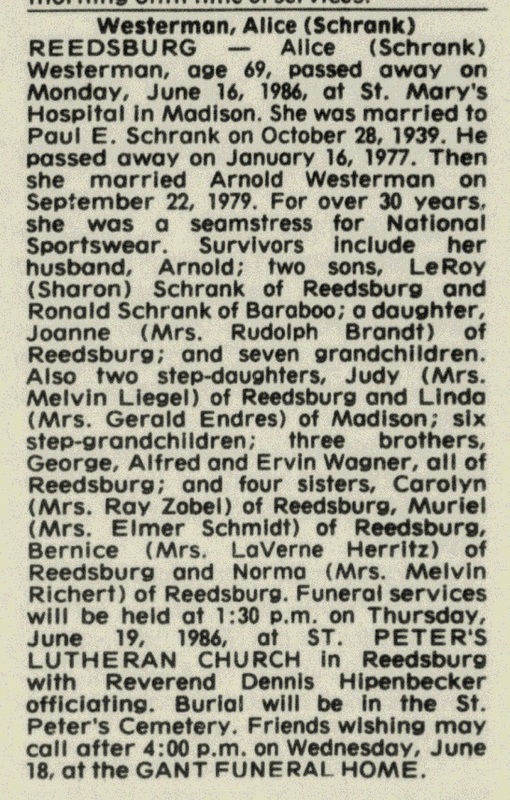 Survivors include her husband, Jake; four children: Brente (Pam) Steinhorst, of Reedsburg; Traye (Dayna) Steinhorst, of Reedsburg; Korrie (Paula) Steinhorst, of Baraboo and Suzie (Tracy) Horkan, of Reedsburg; eight grandchildren: Hannah and Max Steinhorst; Jacob, Jessica and Allison Steinhorst; JoEtte, Kyran and Tarek Horkan; two step grandchildren: Alicia and Elizabeth; one step great granddaughter: Lexie; her sister: Jane (Robert) Bortz, of Beaver Dam; her sister-in-law: Marie Steinhorst, of Reedsburg; many nieces and nephews; other relatives and friends. She was preceded in death by her parents; her brother: John Parkhurst; her step grandson: Arnold; her brother-in-law: Gerald "Bud" Steinhorst and her sister-in-law: Rosalyn (Ed) Vig. Funeral services will be conducted at 11:00 A.M. on Wednesday, January 30, 2013 at St. John Ev. Lutheran Church in Reedsburg with Pastor Christopher Miller officiating. Interment will be in the church cemetery. The family will receive friends from 4:00 P.M. to 8:00 P.M. on Tuesday at the Hoof Funeral Home in Reedsburg. The Hoof Funeral Home is serving the family. Sue Ann Parkhurst graduated in 1952 at Reedsburg High School, Reedsburg, Sauk, Wisconsin. Jon Leo Parkhurst was born on 24 January 1950 at Reedsburg, Sauk, Wisconsin. He was the son of Leo Max Parkhurst and Elvira Dorothea Koenecke. Jon Leo Parkhurst died before 2013. Jon Leo Parkhurst graduated in 1968 at Webb High School, Reedsburg, Sauk, Wisconsin. Name Variation Kathleen Cora Ness was also known as Cora Kathleen. Married Name 14 February 1940 As of 14 February 1940,her married name was Parkhurst. Kathleen Cora Ness was born on 22 January 1917. 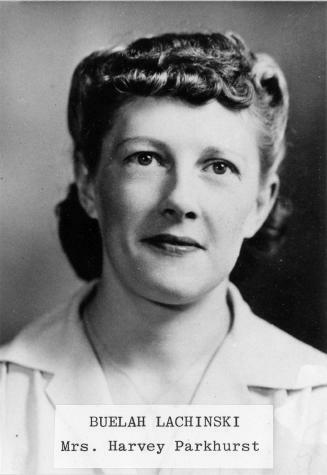 She married Ervin Robert Parkhurst, son of Irvin Alfanso Parkhurst and Emma Amelia Schrank, on 14 February 1940 at Dubuque, Iowa. Kathleen Cora Ness died on 3 May 1983, at age 66. Kathleen Cora Ness obtained US Social Security Card at Wisconsin; last residence Reedsburg, Sauk, Wisconsin. Jerome Frank Meurer was born on 14 February 1917. He was the son of William Meurer and Agnes (?). Jerome Frank Meurer married Marcella Loretta Parkhurst, daughter of Irvin Alfanso Parkhurst and Emma Amelia Schrank, on 9 February 1945 at Central Lutheran Church, Tocoma, Washington, Lutheran. Jerome Frank Meurer died on 6 April 1997 at age 80. Jerome Frank Meurer obtained US Social Security Card at Wisconsin; last residence Reedsburg, Sauk, Wisconsin. Jerome David Meurer was born at Madison, Wisconsin, on 12 August 1948. He was the son of Jerome Frank Meurer and Marcella Loretta Parkhurst. Jerome David Meurer married Joe Ann Popp, daughter of William Popp and Catherine Laubmeier, on 8 June 1968. Jerome David Meurer died on 15 October 2010 at age 62 Jerome and Joe Ann Meurer of Reedsburg died on Friday, October 15, 2010 as a result of an automobile accident near Rockford, IL. Jerome was born on August 12, 1948 the son of Jerome 'Hap' and Marcella (Parkhurst) Meurer. Joe Ann was born on March 4, 1949 the daughter of William and Catherine (Laubmeier) Popp. They were married on June 8, 1968 in St. Luke's Catholic Church in Plain. Joe Ann and Jerry loved their family, Tina and Christopher, their spouses Ben Cone and Elizabeth Meurer, and their sweet grandson, Brody. They loved and found joy in caring for their pets Timber and Tina. They lived a full life, and were genuinely happy people, as was demonstrated by Joe Ann's robust laugh. Joe Ann touched many lives through her work at the Sauk Co. Health Care Center. In her free time she loved busying her hands with needlework. It was a rare occasion to find her without a piece in her hands, her fingers crafting perfect stitches. Jerry enjoyed his work at HoChunk, speaking of it often. At home he loved connecting on-line with people across the globe, and often spoke of his conversations with folks from across the globe. They were both preceded in death by their parents. They are survived by their children: Justina (Ben) Cone of Madison Christopher (Elizabeth) Meurer of Baraboo Grandson: Brody Jerry's Sister: Diane Smith of Lodi Joe Ann's Sisters: Della (Robert) Eberle of Plain Mary (Mike) Hanko of Lodi Elizabeth (Greg) Graf of Poynette Barbara (Kevin) Taylor of Dane Many nieces, nephews along with other relatives and friends. Memorial services will be conducted on Friday, October 22, 2010 at 11:00 A.M. at the Farber Funeral Home. Visitation will be on Thursday from 4-8 P.M. at the Farber Funeral Home. 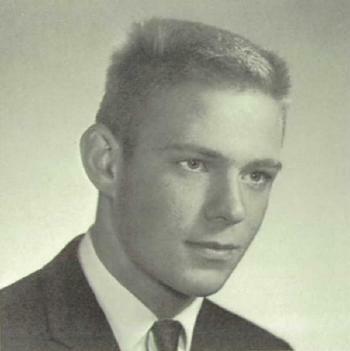 Jerome David Meurer graduated in 1966 at Webb High School, Reedsburg, Sauk, Wisconsin.